SO YOU THINK (NZ) (Bay or Brown 2006-Stud Aust. 2012, Ire. 2013). 14 wins-1 at 2-from 1400m to 2100m, MVRC WS Cox P., Gr.1-twice. Half-brother to SP Now You Know. Sire of SW Gold Rush (Matamata Breeders' S., Gr.2), SP Conscious, Smart as You Think and of Inference, Kaching, La Diosa, Turbulent Air and of the placegetters Neguev, Figure of Grey, Rivo Boy, So Si Bon, So Spirited, The Pinnacle, Too Fast for Love, Vainglorious, etc. His oldest progeny are 3YOs. Madam Delponte (f. by Stratum). Winner at 2 in Aust. Rock the System. 5 wins to 1400m, R295,564, Fairview Racing Association H., Turffontein Knutton Consulting H., 2d Arlington Racing Association H., 3d Arlington Racing Association H.
Yat Ding Win. Winner at 1200m, HKJC Arbuthnot H., 3d HKJC Heron H.
Inta Machnoon. 2 wins at 1200m, 2d QTC Cougar Rum H.
Madam Prosecutor. Winner. See above. The Pope's Choice. 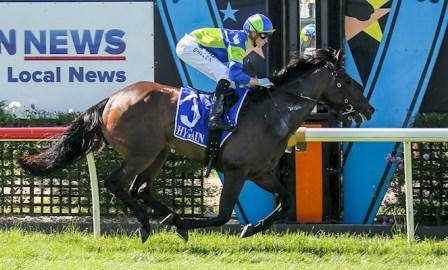 2 wins at 1450m, 2000m in Aust. Famechon Baroness. 3 wins from 1100m to 1800m to 2015-16 in Aust. VERDICT DECLARED (Mr Henrysee). 10 wins. See above. Our Eva. 4 wins to 1200m, MVRC Timbercorp Australia H., 2d MRC Danzero P., Copperama H., 3d MRC Orientate H., Reveille H.
Bear Elite. Winner at 1200m, HKJC Chai Wan H., 2d HKJC Regency Horse H.
LEGAL AGENT (Spectacular Spy). 9 wins to 1200m, A$423,070, AJC Shorts H., Gr.3, STC Star Kingdom S., Gr.3, Missile S., Gr.3, Premiere S., Gr.3, AJC Razor Sharp H., L, City Tatt's RC Lightning H., L, 2d Clarence River JC Ramornie H., L, 3d AJC Challenge S., Gr.2, STC Frederick Clissold H., Gr.3, AJC June S., L.
TERROR FORCE (Al Maher). 5 wins-2 at 2-from 1000m to 1600m, A$237,650, to 2015-16, WATC Perth S., L, Westspeed 2YO P., Police Fire & Emergency Services H., Vale Brandan Thompson H., 4th WATC Fairetha S., L, Old Comrade S., L.